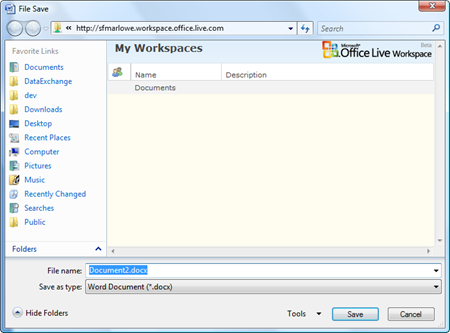 What is Office Live Workspace? A lot of people are mobile these days. I am. I have my laptop with me most times so that when I want to fit in some work on my current novel or other documents I flip it open and go. But every once in a while I leave the laptop at home. The dilemma then becomes one of how do I fit some work in on those documents when the files are not accessible? 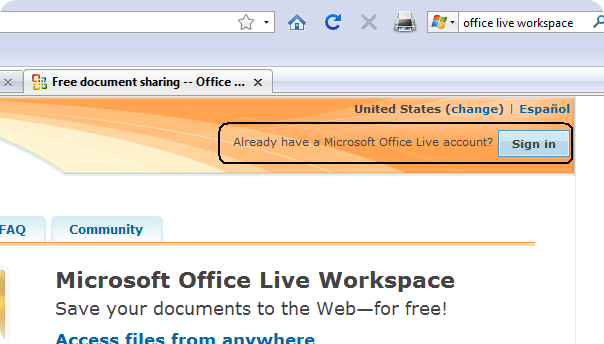 Office Live Workspace is a free "access your documents anywhere" service from Microsoft. With the service you can store hundreds if not thousands of documents remotely, then access those same documents from any computer. Technically, you don't have to have Office on your desktop, but the integration is quite slick, so I would recommend it. Also, the product is beta, so keep that in mind. 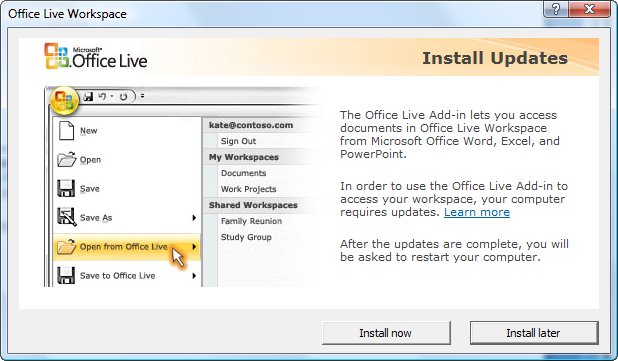 You get hooked up with Office Live Workspace by installing the Microsoft Office Live Add-in available via Windows Update as an optional update. I'll assume you can handle that part of the install since it really is just another update. Also, once you get into the service, you'll likely be prompted to install some updates. Go through the motions and let it install what it needs. 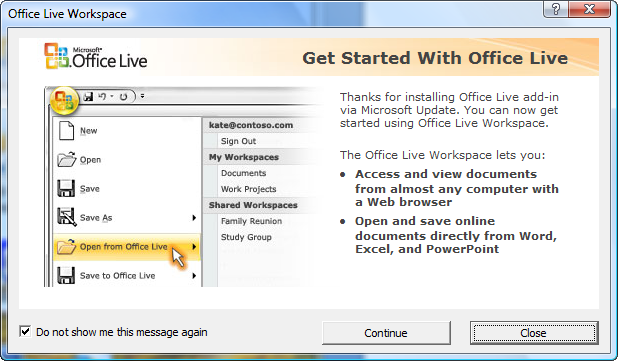 Otherwise, here's the step-by-step to get setup with Office Live Workspace. 2. If you click "Continue" you're brought to the following web site where you can sign up for the Workspace service. 4. Go through the motions of filling in the form in order to set up your account. Good luck with the captcha—it took me more times than I care to admit to get it right. 5. Go to your inbox and wait for the email to show up. When it does, click on the "Activate your workspace" link. That's it. You're in. People familiar with SharePoint will see some commonalities here. Basically you've got a repository for storing documents and other files. You can upload files, create a new workspace for grouping files, or view shared documents if others have opened up their documents for you to see. Uploading a document is easy. Let's do it through the web page first, then we'll look at how to save a document to the remote Workspace from within Word. 1. From your Workspace page, click on "Add Documents". 2. 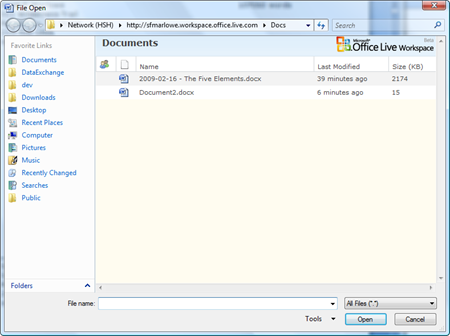 Navigate to a file using the resulting Open dialog and select it. 3. You'll see a progress bar next to the title of your document as it uploads. The time it takes to upload your file depends on the size of the file. 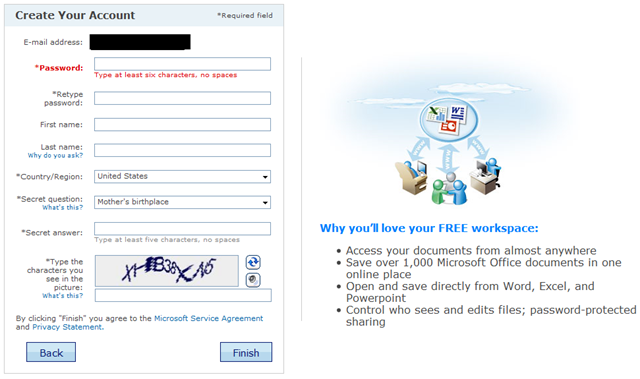 Now, if you're using Microsoft Word you can upload files directly from there. 1. First, sign-in using the account you created above. 2. This is one of those times mentioned above where you'll need to install some updates. Click through until it's happy. Unfortunately, you will be asked to reboot. Once you've done that, open up Word again, select "Save to Office Live" again and sign-in. 3. A File Save dialog will pop-up. Double-click on the "Documents" folder (it doesn't look like a folder, but that's what it is) and click "Save". Just like saving/uploading a document can be done from the web interface or through Microsoft Word, so can opening a file. 1. To open a file through the web interface, locate the "Edit" (leftmost) button. 3. Your document will open in Word or whatever program is assigned to open the file type you chose. 1. 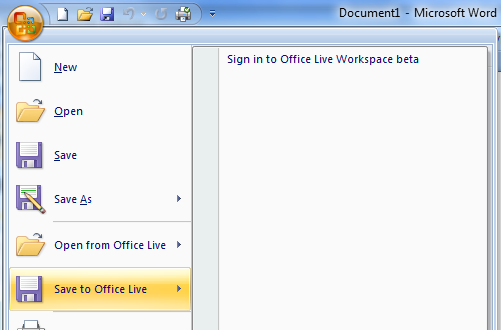 Select the "Open from Office Live" menu item. A File Open dialog will pop-up. Select your file. 2. Click "Open" and your document will open in Word. Make changes and save. You'll see the "Saving" dialog again as the document is saved off to the remote Workspace location. That's all there is to it. You've signed up for an Office Live Workspace account, uploaded a file to the service, opened it from the remote location, made changes, and saved it back. I'm planning on using Office Live Workspace for those days when I don't have my laptop with me but where I also have some time to work on documents I typically only store there. I do have some concerns over security—I'm not going to store personal financial data out there. But as long as the service remains stable I think it will help me stay productive. 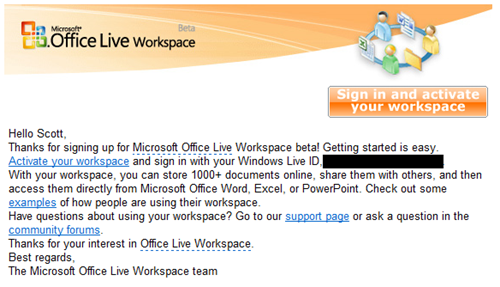 For more info and assistance visit the Office Live Workspace Community page. A breakdown of the various e-book file formats. One of my most popular posts! Don't you have an issue with having your documents on a 'public' site? Once the document is sitting on Microsoft's server (or Google's, or...), it's available to them for searching and archiving, or whatever. I'm not comfortable with that, so I stay away from doing stuff like this. That's a good point, but no, it doesn't really bother me. Like I said in the post, I'm not going to put highly sensitive financial information out there (like copies of my paycheck, for ex. 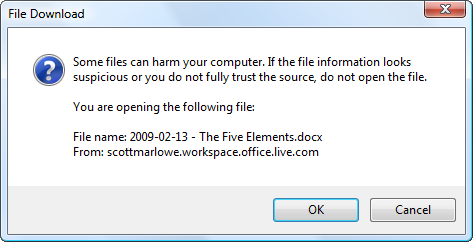 ), but as far as documents that I consider less sensitive... technically the files [i]should[/i] be secure. As secure as anything can be on such a site, anyway. OK, so you got me thinking about security. Given what this thread says about the lack of SSL (officeliveworkspacecommunity.com/.../4371.aspx), it [b]is[/b] possible for someone using a packet sniffer to intercept your unencrypted files as they are being transferred back and forth to your Workspace. Theoretically, they should be secure while stored in the Workspace, though. Since I'm specifically going to use the service to store Word docs, I went ahead and at least added a password via Word. It's always better to have multiple layers of security, anyway. I suspect the Office Live team will get onboard with SSL sooner rather than later least people stay away from the service. That provides some reassurance, I think. That does make me feel better. I'm not up to date on the password feature of Word, does it also encrypt the data in the file? Yes, Word (I'm talking specifically Word 2007 here, but the previous versions may have this as well) does in fact encrypt the contents of the file. Look for "Prepare" and "Encrypt Document" in the menus. You'll be prompted for a password and there you go. Word uses 128 bit encryption, which qualifies as "pretty darn secure" in my book. I've been using the workspaces for a while and the bigest issue I have is when I installed the add in for office 2007. I continually get the dialog box even if I have the "Do not show me this message again" box checked. I also am using it for non-sensitive handouts, pdf's and such and other documents for clients that are not private.